Last weekend 38 members from SeniorsAloud and University of the Third Age (U3A) Malaysia went on a 3-day joint trip to Singapore. 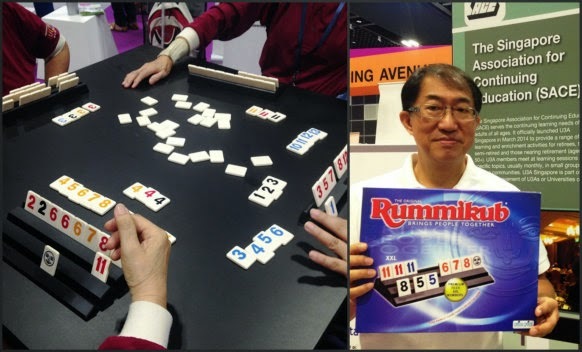 Our main purpose was to visit the 50plus Expo 2015, but we also took in some sightseeing on Day 1, and a visit to Econ Medicare Centre and Nursing Home on Day 3. More of that later. The trip was originally scheduled for 27-29 March. When Singapore's founding father Lee Kuan Yew passed away on 23 March, PM Lee Hsien Loong announced a 7-day national mourning period. As a result, the organizers Council for Third Age (C3A) and PICO had to postpone the expo to 15-17 May. If I remember correctly, the first 50plus Expo was held in 2009 to promote active ageing. 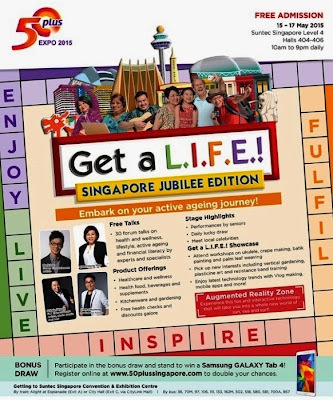 Since then it has become a much anticipated annual event for older Singaporeans. I have visited it twice, in 2010 and 2011. It has grown bigger and better over the years. I had expected this year's Jubilee Edition to be even bigger and on a grander scale. But it didn't seem to be so. Perhaps the last minute change of date had affected the participation of some exhibitors and speakers. Still, our group spent an enjoyable and fun day at the expo. There was much to see, do and learn as well, from health checks to food sampling, from games to entertainment on the stage. A pity, though, that the forum talks were held on a separate floor, and required pre-registration. Otherwise, many more of us would have attended the talks as the topics were of interest and relevance to seniors. 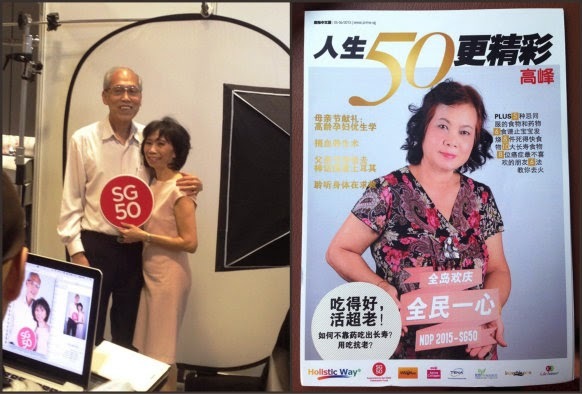 Senior Minister of State from the Ministry of Health and Manpower Dr Amy Khor, and Chairman of C3A Mrs Chua Foo Yong at the launch of 50plus Expo 2015. They sat on benches just like the rest of us. Exemplary! 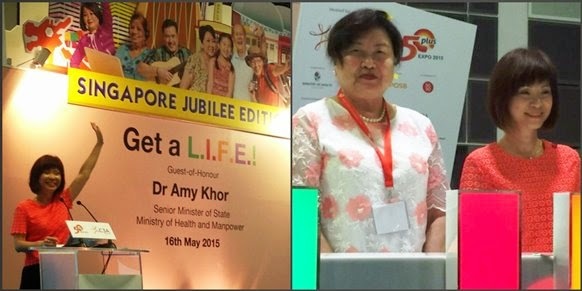 In line with Singapore's Jubilee celebrations this year, Dr Khor announced that the Ministerial Committee on Ageing is offering 400 free courses for seniors as part of the SG50 Seniors package. You can imagine the boisterous response from the crowd. More reason for the Singapore Cheer! Here is a small selection of photos taken at the expo. If you missed this year's expo, do make sure you visit it next year. It'll be worth your time. For now, do check out C3A's portal at http://www.c3a.org.sg/. It's packed with plenty of info and goodies for seniors. Always fun to play around with make-up for a new look. For ladies only? Don't men need grooming too? Puan Kasummah was interviewed by ST. 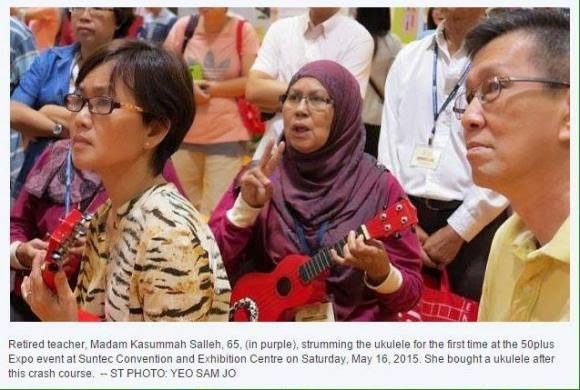 This image appeared in Straits Times' online write-up about the expo. Portrait photography inclusive of styling by professionals, and you are ready for a cover shoot! 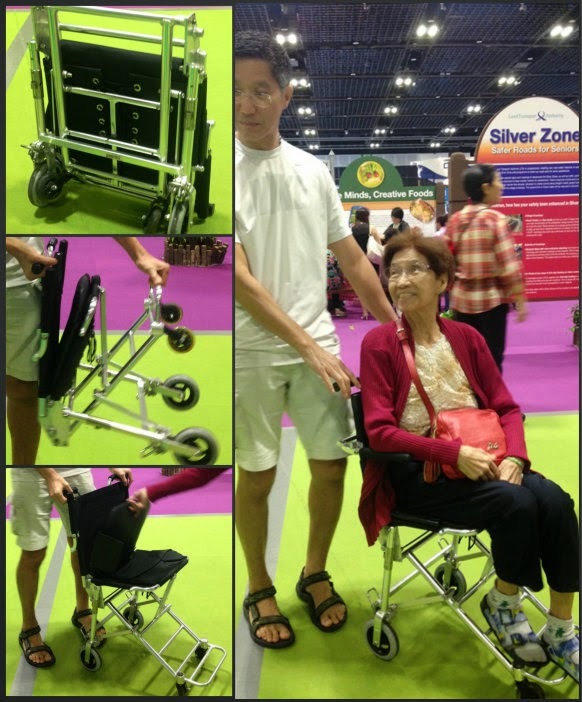 Spotted this foldable wheelchair at the expo. This young man and his mom were kind enough to give a demo. Always great to meet up with Singapore friends like Eleanor Yap (left, back row) of Ageless Online and members of RSVP Singapore. With members of YAH (Young-At-Heart) College. On behalf of the group members, SeniorsAloud would like to thank C3A for the warm welcome given to us. A special note of appreciation to C3A's Ms Tan Si Ling and Ms Cheryl Ho for arranging the logistics for our visit, and to Ryan Lau for the guided tour and briefing. It's time we had an expo for seniors in Kuala Lumpur. There have been several in the past, but nothing on the scale of 50plus Expo. Well, never too late. Will the private sector or the relevant government agencies take up the challenge? WHAT DO SENIOR CITIZENS IN MALAYSIA WANT?